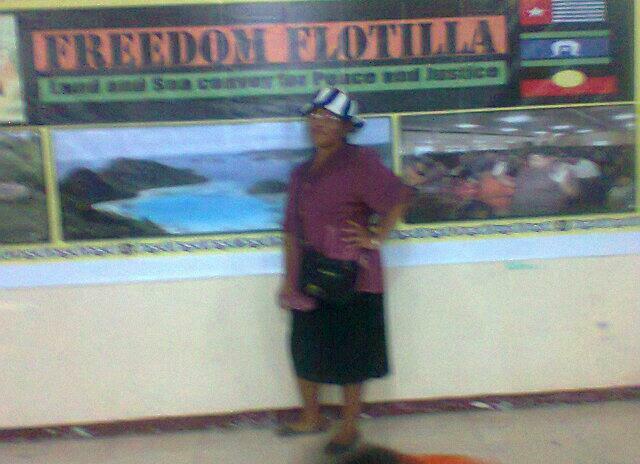 Indonesian police in Sorong, West Papua, yesterday arrested four leading Papuan customary leaders for organising a welcome celebration and prayer for the safe arrival of the Aboriginal-led Freedom Flotilla, currently sailing from Australia. 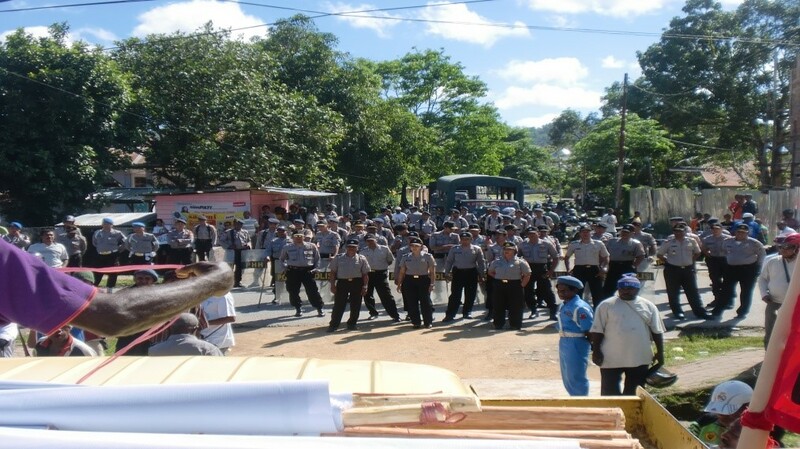 The four were arrested after over 200 armed police surrounded a peaceful prayer gathering at Marantha Church in central Sorong yesterday afternoon, after thousands of local people joined with religious and adat (customary) leaders, and leaders of the self-declared National Federated Republic of West Papua (NFRPB) alternative government, to express their solidarity with the aims of the Freedom Flotilla. The Freedom Flotilla is a journey being conducted with Aboriginal and West Papuan elders and Australian activists to highlight internationally the human rights situation in West Papua and is currently enroute sailing from Australia to West Papua. 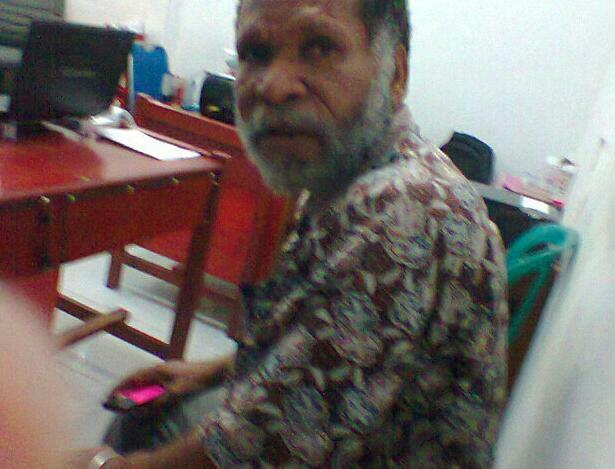 Internationally renowned environmental defender, researcher and customary leader, NFRPB Sorong secretary Yohanis Goram, was arrested together with Apolos Sewa (Vice chair of Dewan Adat Papua, Greater Sorong), Amandus Mirino (NFRPB State Secretariat senior worker), and Samuel Klasjok (NFRPB’s alternative Chief of Police (Security) for region 3, Doberay). 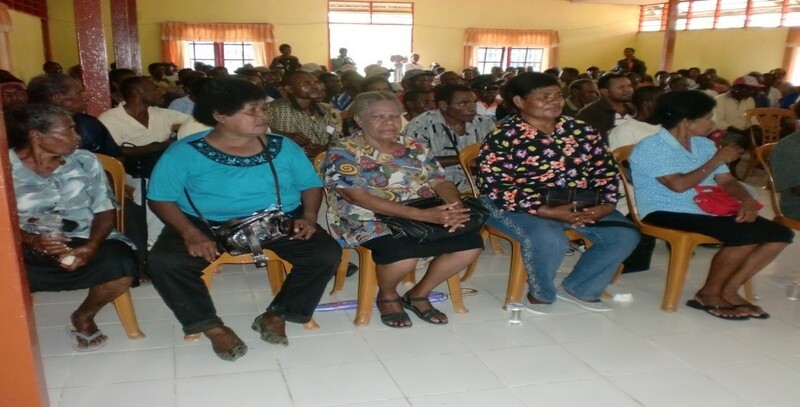 Sorong Police Chief Harry Goldenhad met with the organisers of the gathering, and initially “approved the activities with the proviso that they did not disturb the peace, and maintained security,” according to witnesses statements provided by established credible sources to West Papua Media. Over 2000 people had gathered for the solidarity event that spilled outside the large church compound. About 45 minutes after the prayer meeting had finished, as participants were preparing for a press conference with local media including such as Radar Sorong, West Papua Post, and Fajar Papua, Police Chief Goldenhad took ten heavily armed officers into the church and arrested the four activists. According to local sources who spoke with police and activists, Based on information collected on site, the arrests were made in connection with the unfurling of the Morning Star, Aboriginal, and Torres Straits flags inside the church. 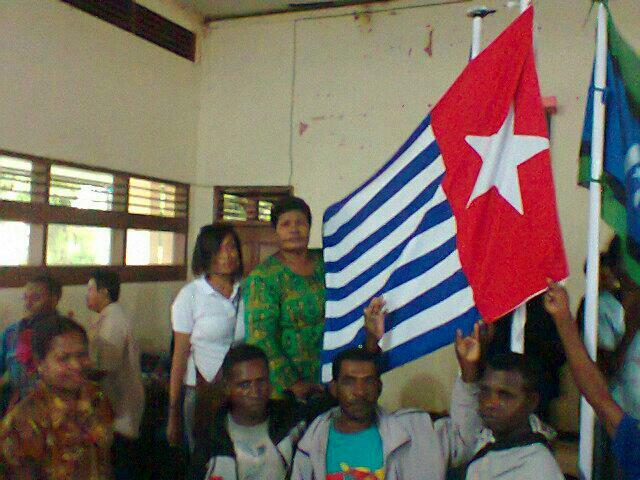 The four activists are still being held at Sorong Police headquarters according to local sources, and their condition is unknown. However grave fears are held for their safety, as these are the first West Papuans to be arrested over a connection to the Freedom Flotilla, which has attracted significant international media interest, and ignited major controversy and comment from Indonesian and Australian government ministers. “Amnesty International calls on the Indonesian authorities to respect the rights of Papuans to freedom of expression and peaceful assembly which are guaranteed in Article 19 and Article 21 of the International Covenant on Civil and Political Rights (ICCPR), to which Indonesia is a state party. Our organisation is concerned that the Indonesian government has consistently failed to make a distinction between violent armed groups and peaceful activists, and between peaceful expression of opinion and acts of physical violence, ” Benedict told West Papua Media by email. Activists on board the Freedom Flotilla have reacted with dismay at the news of their supporters being targeted inside West Papua, but say this highlights the daily denial of Freedom of Expression for Papuan people, that originally motivated their plans for direct action. 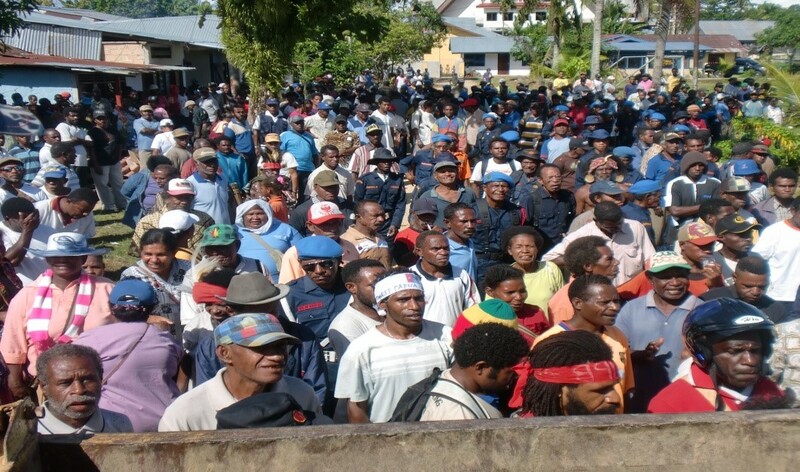 Kareni explained, “The a rrests yesterday of the four Papuan leaders are a reflection of the reality that there is no space for democracy in Papua and West Papua Province under the Indonesian occupation, and yet foreign governments are complicit to these ongoing abuses. The Freedom Flotilla to West Papua is aiming to highlight this entrenched long-term brutality that is demonstrated by these arrests. 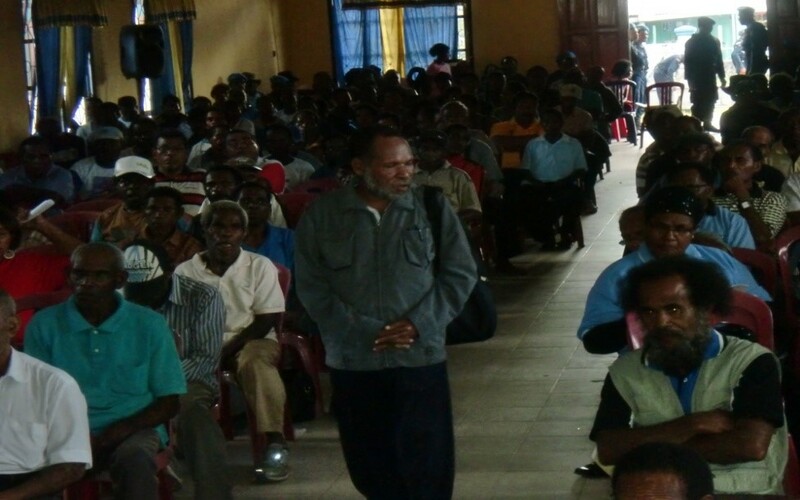 Arabunna elder, Uncle Kevin Buzzacott, the elder who inspired the journey, said in a statement to West Papua Media, “Indonesian government – you must immediately release those 4 prisoners and not to harm them in any way. They need to be released and not to be harmed because they have not committed a crime. We felt very sad when we seen it in the news today. We are waiting for the other mob to turn up here on Horne Island so we can work out how to respond a bit more but for now we need to ask all Australians to take a firm position on this issue, to be strong for Human Rights in West Papua. They are hurting them everyday, for years and regardless of the Freedom Flotilla this is happening, but we having a go, tryin’ to get the World to see, to look and listen and take a stand for these people. The Papuans have had it rough for too long with Indonesia there and this can’t keep going on. The prisoners must be released immediately”. Bangsa yang ber-Moral adalah bangsa yang menghargai hak asasi dan Demokrasi, kalau hanya demo dengan mengadakan kebaktian dan doa bersama, kenapa harus ditahan atau ditangkap??? Jakarta anda harus mendidik aparat2mu. ataukah itu kebijakan darimu? sangat memalukan! perlu anda ingat perbuatan polisi di sorong akan semakin menambah semangat perjuangan bangsa Melanesya di Papua untuk melepaskan diri dari NKRI….!!!!!!!! 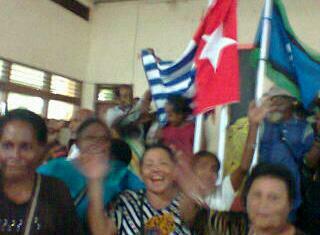 Mi laikim save olsem yupela plisman save olgeta NID bilong yupela TRU, na save TOKSAVE olsem long Papua manmeri. Plis toksave olsem wanem samting yu nidim kisim long papua manmeri, orait ? Na plis mekim klia olsem yupela akseptim olgeta manmeri i lakim mekim desisen PRI olgeta taim !! !